The Allegany County Community Action Agency, now known as the Allegany County Human Resources Development Commission (HRDC), was established in 1965. For the overwhelming majority of those years HRDC was led under the Executive Directorship of Jane Rees-Schwartz. 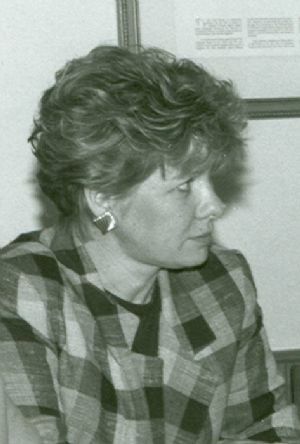 Jane began at HRDC in the early 1970s and within several years was appointed Executive Director. Under her tenure HRDC expanded to about 200 employees, a budget of almost $7 million, and an array of programs incorporating Head Start, housing, energy assistance, senior citizen centers, adult day care, homeless intervention, weatherization, and more. Upon her retirement in 2004 after “33 years, 10 months, and 19 days at HRDC”, Jane summed up her career at HRDC with a quote from Teddy Roosevelt, “Far and away the best prize in life is the chance to work hard at work worth doing”. Photograph from Cumberland Times-News. Used with permission.